1. This free printable from Oh So Printable is the perfect way to document the all-important first day of school. 2. Help your student understand the amazing world around them with this vintage globe. I love statement pieces that are both fun and educational, and this globe is definitely both! 3. 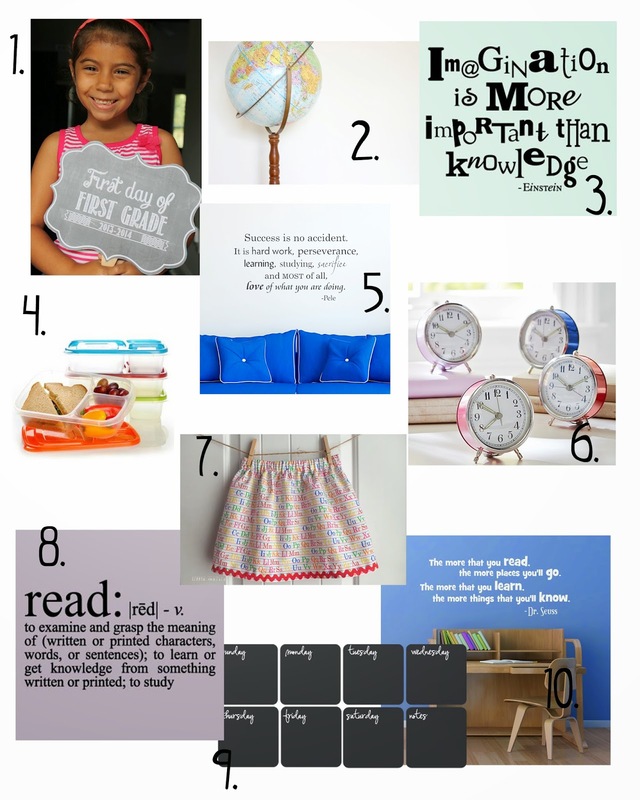 Featuring eye-catching typography, this Wall Quotes™ decal is perfect for a playroom, bedroom or homeschool room! 4. Whether you want to pack a simple sandwich or craft an elaborate meal, send your child's lunch to school in style with this fun and functional bento box! 5. Yes! The ingredients for success are simply and eloquently stated in this Wall Quotes™ decal. I love wall art with a message; what a perfect sentiment to help your loved ones achieve their best. 6. With retro styling and fun colors, this alarm clock from Pottery Barn Kids gets an A+ for both form and function. 7. She loves clothing that is bright and fun, and you love clothing that is high-quality and well-made. You both get what you want with this adorable skirt from Etsy! 8. I love "definition art," and this Read Wall Quotes™ decal , is perfect for encouraging your young reader. 9. At the start of a new school year, getting organized is key. It's also easy and good-looking with this Chalkboard Weekly Calendar. Removable and repositionable, it's a stylish way to keep track of all the events and deadlines that come with Back to School time. 10. "The more that you read, the more places you'll go. The more that you learn, the more things that you'll know." Dr. Seuss says it best with this perfect-for-any-room-in-the-house Wall Quotes™ decal.